For three nations - New Zealand, Australia and Turkey - the Gallipoli campaign was a defining event. What led to this? In the second half of the 19th century, the rise of Germany profoundly altered the security situation in Europe. Opposing alliances emerged to create a balance of power that persisted until 1914. War broke out when this balance of power was upset by a diplomatic crisis that spiralled out of control as the states involved began to mobilise. New Zealand and Australia were part of the British Empire. It, along with the French and Russian Empires, formed the alliance known as the Entente Powers, or the Allies. The opposing alliance – the Central Powers – was led by the German and Austro-Hungarian Empires, and was joined by other forces including the Ottoman Empire (based in what is now Turkey). Battles raged along the Western Front in Europe, but by late 1914 had reached a stalemate. Looking for an alternative strategy, the British authorities decided to try and knock the Ottoman Empire out of the war. They believed that an Allied fleet arriving off the Ottoman capital of Constantinople (now Istanbul) would achieve this end. After securing an Ottoman surrender, the British and their allies could march north through south-eastern Europe to strike at the Central Powers’ soft underbelly. To get to Constantinople, the Allied fleet had to pass through the narrow, heavily defended Dardanelles Strait. When their attempt to do so foundered on 18 March 1915, the Allies decided to land troops to neutralise the forts guarding the strait. 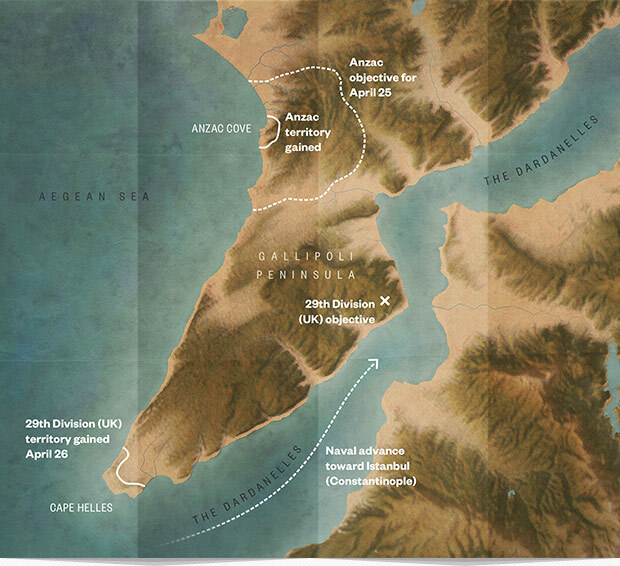 They planned a main attack on the southern tip of the Gallipoli Peninsula at Cape Helles, and a secondary attack further north near Gaba Tepe. The Anzac force – the New Zealanders and Australians – would make this secondary landing. It was planned that the Anzac force of 27,000 men would land in successive waves: first the Australians, then the New Zealanders. The Australians would move rapidly up to take the high ground of the Sari Bair Range, and then the New Zealanders, landing later, would drive forward to the other side of the peninsula. In this way, the Anzacs would assist the Allied forces who were attempting to move north from Cape Helles. The intent of the Anzac landings was to cut off supply lines to the peninsula. 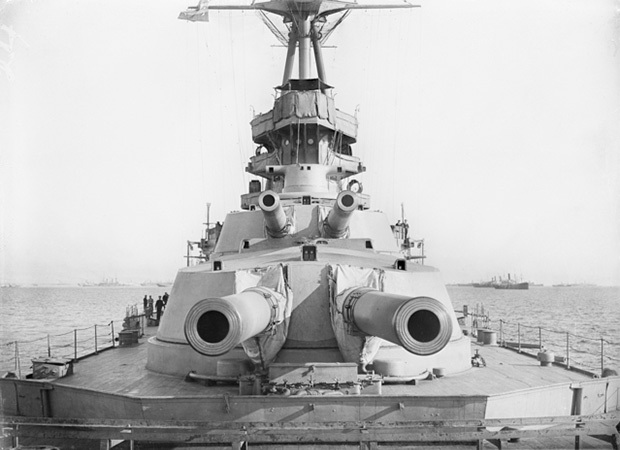 This would ensure the 29th Division could capture the Ottoman naval forts which lined the Dardanelles, permitting the British navy to advance to Constantinople unhindered. When the Anzacs began landing on 25 April, the plan went wrong almost straight away. They were supposed to be put ashore at Gaba Tepe, on a broad beach with a wider front. Instead – probably due to navigational errors – their boats ended up at what later became known as Anzac Cove, where the land above was rugged and steep. It provided a relatively protected and virtually undefended landing place, but made carrying out their plan much more difficult. The few Ottoman defenders at Anzac Cove were quickly overrun. However, reinforcements were soon on the way. Some of these arriving troops threatened the Anzac positions from the south-east; others were able to forestall the Anzacs’ attempt to secure the Sari Bair high ground. By the time the New Zealanders arrived to reinforce the Australians who were trying to push up the ridge, there was nothing they could do to change this. Trekking inland, the Anzacs struggled with the steep, dangerous terrain, and were shot at by Ottoman forces they often couldn’t see. Casualties were horrific and by nightfall, confidence had evaporated. Nonetheless, the Anzacs dug in. By the end of April, the Anzacs had established a tenuous defence line along what they called Second Ridge – a long ridge in the Sari Bair Range. They took an area of less than 6 km square, but were unable to make further headway. 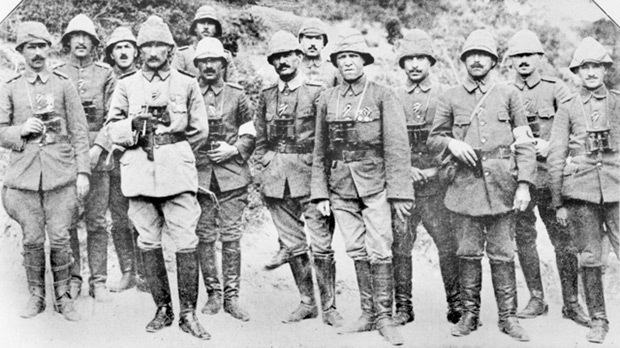 For two months they engaged in bloody trench warfare with the Ottomans – who they referred to as ‘the Turks’. A view south along the front line from Quinn's Post to Lone Pine in the distance. The Anzacs held the ground to the right of the road, while the Turks held the left. 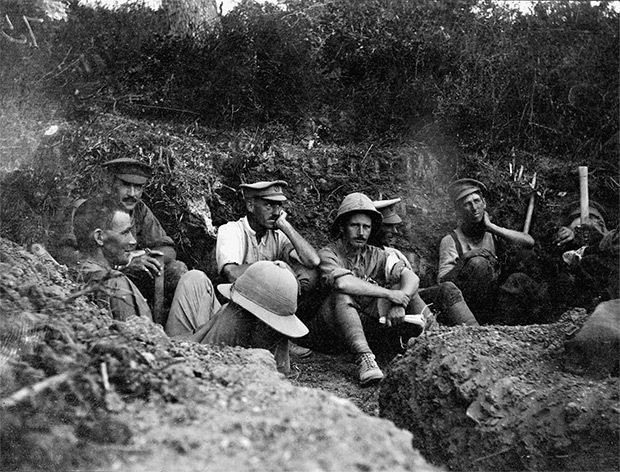 No place within the Anzac perimeter was safe from Ottoman fire, and the men lived with the frightening knowledge that they could be hit at any time. They also suffered from malnutrition and dehydration, as their area was almost waterless. The trenches were filthy, and disease was rampant. All the same, the Anzacs made their defences very strong and on May 19, they defeated a large Ottoman attack with relative ease. While the Australians and New Zealanders held Anzac Cove, the British and French attempted to drive north from the narrow beachhead they had seized at Cape Helles, on the southern tip of the Gallipoli peninsula. In early May, several brigades of Anzac troops were brought down from Anzac to bolster an Allied attack. This three-day onslaught would become known as the Second Battle of Krithia, after the village that was the first target. The Allies gained little ground and suffered heavy casualties. In August 1915, after over three months of stalemate, the Anzacs took part in a daring new plan to capture high points on the Sari Bair Range. It was a gruelling assignment for the sick and exhausted men, but on August 8 the New Zealanders briefly tasted triumph when, with British infantry, they reached the summit of Chunuk Bair, one of the Sari Bair high points. They held trenches on the summit for two days, but the failure to seize the other two high points doomed the offensive, and the Turks soon drove the Allies off Chunuk Bair. Later in August, the Anzacs took part in attacks on a small rise at the junction of the Suvla Bay and Anzac fronts – Hill 60. This attack was also in vain, and would be the Allies’ last offensive action around Anzac. After Chunuk Bair and Hill 60, the depleted New Zealand troops were withdrawn to the Greek Island of Lemnos to rest. It was a short stay, and when the men returned to Gallipoli, many remained ill and weak. What’s more, a harsh winter was setting in, bringing the risk of frostbite and hypothermia. The Ottoman forces, on the other hand, were growing stronger. It was now obvious to the Allies that the Gallipoli campaign could never be more than a costly failure, and the British authorities finally made the decision to pull out. The Anzacs were evacuated in December, and the British and French followed in January. The Ottomans celebrated victory. Although a failure for the Allies, the Gallipoli campaign was also a disaster for the Ottomans. Their losses severely compromised their efforts to conduct the ongoing war, which they ultimately lost. However, perhaps the most far-reaching, and lasting, effects of the campaign were on the national identities of New Zealand, Australia and Turkey. They are strongly felt to this day.